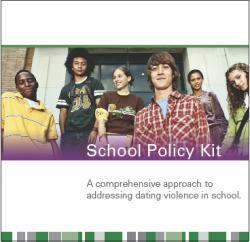 The School Policy Kit will guide schools and school districts through the process of creating policies and protocols necessary to meet the challenge of teen dating violence. Teens need trusted adults who are trained and prepared to respond to the issue of dating violence. The School Policy Kit will guide schools and school districts through the process of creating policies and protocols necessary to meet the challenge of teen dating violence. Provide key resources to teachers, staff and students. This resource is designed for both middle and high school settings and provides specific information related to each particular population. Protect schools from potential action related to dating violence on campus. In 2008, Break the Cycle partnered with the DC Office of Victim Services and the District of Columbia Public Schools to launch a comprehensive program to address teen dating violence. This pilot program was the foundation for our model school policies.